Crystal therapy is a tried and tested complementary therapy that works on the physical, emotional, mental and spiritual levels. Its holistic approach means the whole person is taken into account not just their symptoms. It promotes health by relaxing and re-energising the body. This creates a sense of wholeness and balance and helps the body heal itself. 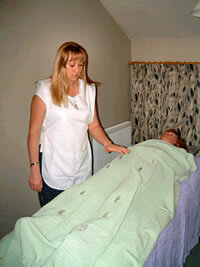 Crystal treatments are excellent at relieving stress and are very relaxing. A crystal therapy treatment lasts about an hour. A full case history of the client is taken on their first visit (this takes about 15 mins extra). This establishes a thorough background of the person and allows an individually tailored session to be developed. The client should wear natural fibre clothing if possible, as they conduct energies better than man-made fibres. The client either sits on a chair or lays fully clothed on a massage couch for the treatment. The crystal therapy treatment begins with the therapist 'tuning into' the patient. The therapist holds the clients feet during this 'tuning in' and detects their energies (this checks their current level of energy and balance). 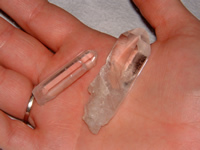 The therapist places clear quartz single terminated crystals on the clients body, pointing up the left side and down the right. This develops a good flow of energy within the client (we receive energies through our left side and give them out through our right). The therapist then clears energy blockages in the physical body, chakras (energy centres) and aura (human energy field). 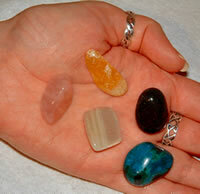 Specific crystals are placed on the body and chakras to raise the clients energy levels. The client may feel heat/cold or tingling sensations during the treatment. Some people do not feel any tingling but do feel deeply relaxed and energised. The clients energies are then grounded. A foot massage at the end helps to 'ground' the client even further (or hand massage for those with ticklish feet!). At the end of the treatment, the therapist discusses the treatment with the client and may recommend further treatments or crystals to use at home. Why not treat someone to a relaxing crystal therapy treatment? Gift vouchers are available and they make an ideal birthday or Christmas present. Vouchers are valid for 3 months.